In Shelby Park - mainly open with rolling hills and beautiful views of downtown and the Cumberland River. From I-24; exit 49 - Shelby Ave. Turn right on 5th St, turn left Davidson (Music City Bikeway sign). Take the first left once you enter the Park. 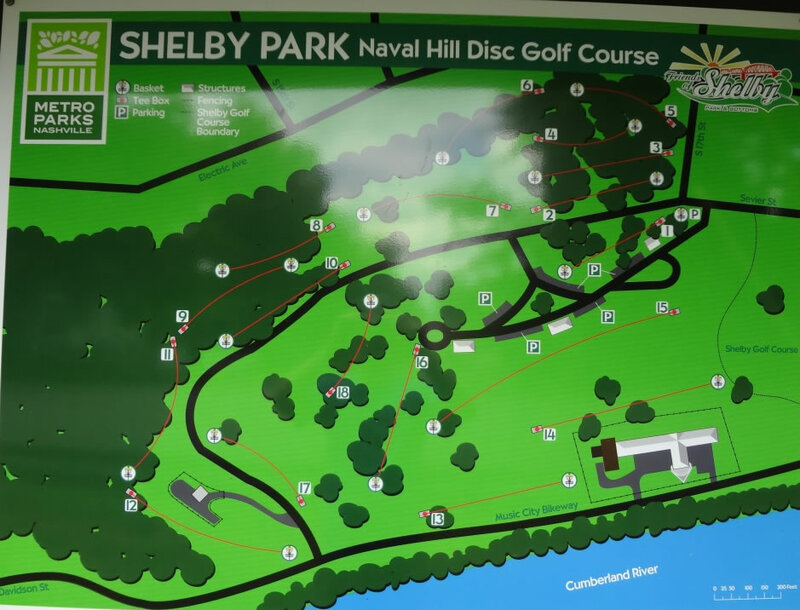 Parking for hole 1 is at the top of the hill. Solid course in a well maintained park. Almost every hole is on a hill in some way. So, you'll get a workout walking this course. A few holes have some nasty rough on tight throws. Hole #12 has been lost to construction so take note you skip to #13, tee box is next to the main road near the entrance to the park. There is a hole 19 so there are still 18 total. Good open course, good variety of wooded, open and short,long holes. Good use of elevation.